The US Bureau of Safety and Environmental Enforcement (BSEE) completed the first full-scale deployment of critical well control equipment over the summer..
MWCC operations superintendent Chip Ledbetter provides BSEE director James A. Watson and BSEE lead inspector Kelly Bouzigard with an overview of the capping stack in Houston during pre-deployment testing prior to a containment exercise. 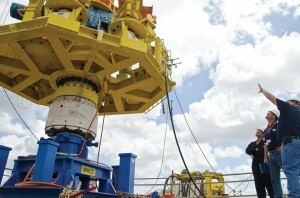 The US Bureau of Safety and Environmental Enforcement (BSEE) completed the first full-scale deployment of critical well control equipment over the summer to exercise the oil and gas industry’s response to a potential subsea blowout in the deepwater Gulf of Mexico (GOM). BSEE director James A. Watson confirmed that the capping stack system passed a pressurization test according to the requirements in the scenario, marking the end of the exercise. The unannounced deployment drill, undertaken at BSEE’s direction, began 24 July to test Marine Well Containment Company’s (MWCC) capping stack system, a 30-ft tall, 100-ton piece of equipment similar to the one that stopped the flow of oil from the Macondo well in 2010. During the exercise, the capping stack was deployed from its storage location near Houston to an area in the GOM nearly 200 miles offshore. The system was lowered to a simulated wellhead on the ocean floor in nearly 7,000 ft of water, connected to the wellhead and then pressurized to 10,000 lbs/sq in. In the Arctic, BSEE also oversaw capping stack tests. BSEE Alaska region director Mark Fesmire oversaw comprehensive testing of Shell’s proposed Arctic-ready capping stack system in Puget Sound to ensure compliance with standards established since 2010. The capping stack was deployed from the icebreaker Fennica into Puget Sound near Everett, Wash. The total exercise took approximately two hours. During the tests in June, Shell successfully deployed the capping stack to 200 ft of water, deeper than their proposed well sites in the Arctic, and confirmed that the capping stack would function under pressures exceeding the maximum expected pressures. Similar pressure tests will be conducted regularly in the Arctic if Shell receives permits from BSEE for exploratory drilling offshore Alaska. In late August, Shell received approval for limited preparatory activities in the Chukchi Sea, including creating a mudline cellar and drilling and setting the first two strings of casing into shallow non-oil-bearing zones. A new federal interactive online mapping tool used by emergency responders during the Macondo incident has been expanded to include the Arctic and will help address challenges in the Arctic posed by increasing ship traffic and proposed energy development. The US National Oceanic and Atmospheric Association (NOAA) and the Department of the Interior’s Bureau of Safety and Environmental Enforcement (BSEE) called the Environmental Response Management Application (ERMA) an important step forward for the Arctic region. ERMA brings together information needed for an effective emergency response in the Arctic. The tool is equipped with near real-time oceanographic observations and weather data from NOAA and critical environmental, commercial and industrial data information from BSEE. Responders can further customize the tool with environmental, logistical and operational data, such as fishery closure areas, resources at risk maps and mariner notices, depending on the need. AGR and Statoil are joining to develop a new-generation managed pressure drilling (MPD) solution for floating rigs. This phase of the project is worth US $5.1 million. The development project will build on two technologies: AGR’s EC-Drill system and Ocean Riser Systems’ Low Riser Return System (LRRS). 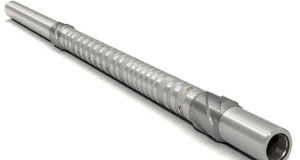 The EC-Drill has been used on two deepwater wells in the Gulf of Mexico since its introduction earlier this year, and a shallow-water version of EC-Drill has been used previously offshore Brazil, Egypt and in the Caspian Sea. 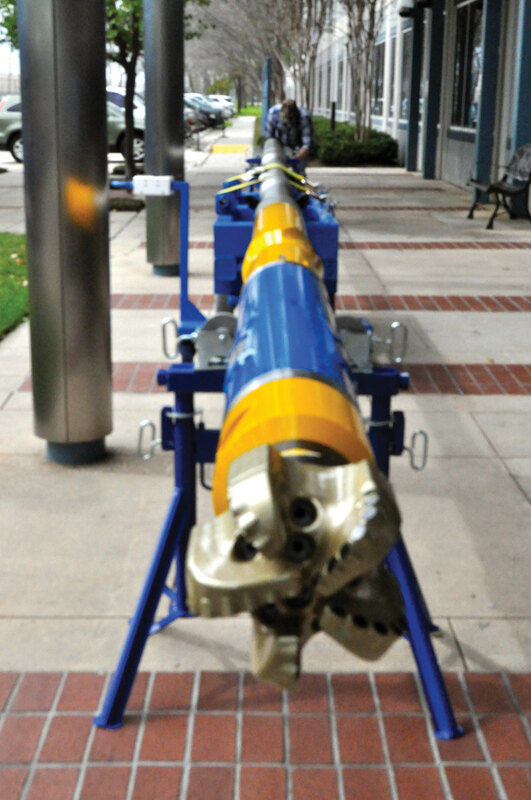 Baker Hughes’ AutoTrak Curve rotary steerable system. Ocean Riser Systems and Enhanced Drilling Solutions, part of AGR, recently merged to form EDS-ORS. “EC-Drill gives our clients a far greater degree of control, enhances safety and enables them to cost-effectively hit deep targets that are simply impractical to reach with more traditional techniques,” David Hine, executive vice president at EDS-ORS, said. Baker Hughes’ AutoTrak Curve rotary steerable system recently eliminated two rig days compared with average offset wells for a client in the Eagle Ford. The well consisted of vertical, curve and lateral sections exceeding 10,400 ft of total footage. The AutoTrak Curve system allowed the client to drill out the 9 5/8-in. surface casing and subsequently drilled from 2,631 ft to 13,188 ft in one run for a total footage of 10,462 ft. 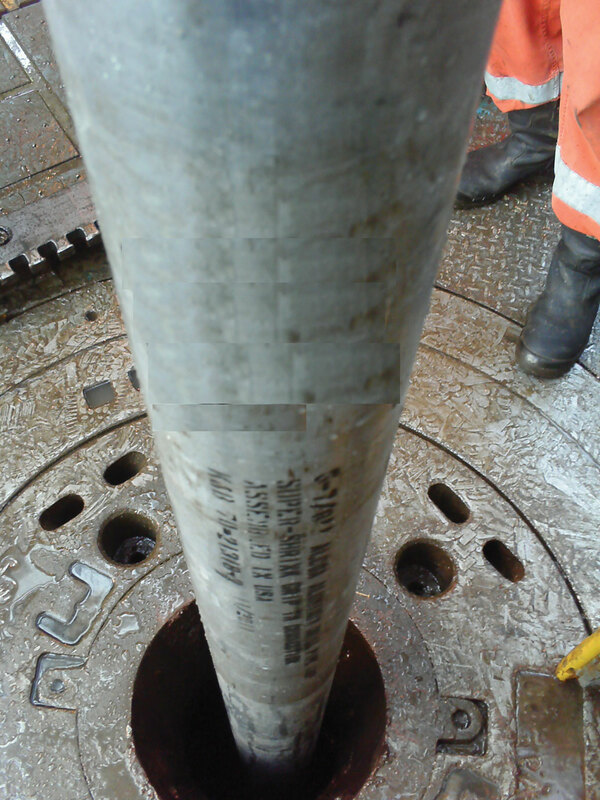 The system drilled the vertical section of the well and was able to kick off in the correct direction, building to 88° inclination with an 8°/100-ft buildup rate. Once the curve was landed, the system drilled the entire lateral section. The system maintained an average ROP of 90 ft/hr through all sections. 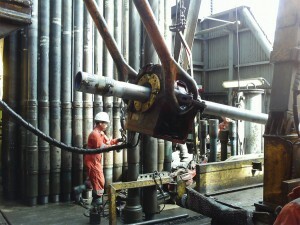 An iron roughneck positions a string of Alcoa Aluminum Alloy Drill Pipe (AADP) to be run. The pipe helped BSP to drill a complex well with three S curves and a long horizontal section to 7,485-meters TD in 60 meters of water offshore Brunei. 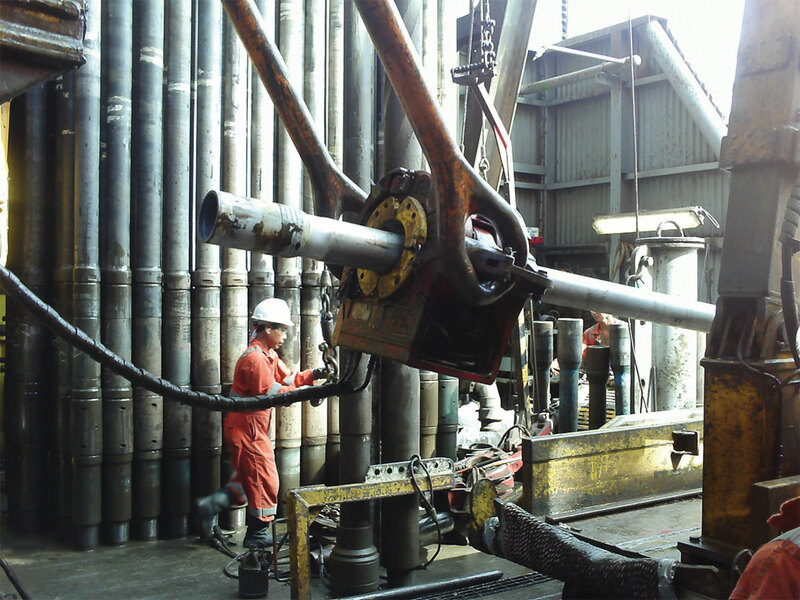 Alcoa Oil & Gas has deployed 1,800 meters (5,905 ft) of aluminum alloy drill pipe (AADP) in the Iron Duke Well C offshore Seria, Brunei. The Brunei Shell Petroleum (BSP) well is considered among the most complex and deviated in the BSP system, with three S curves and a long horizontal section of approximately 5,000 meters (3 miles). It was drilled to a total depth of 7,485 meters (4.6 miles) in about 60 meters (197 ft) of water. 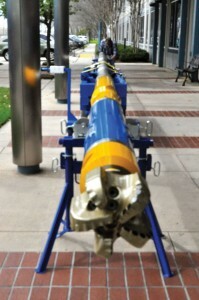 “The AADP, which is produced in 30-ft (9.1-meter) aluminum tube sections and joined together using standard steel connections, is about 40% lighter than all steel pipes and has the potential to significantly reduce drill string hook load and related drilling torque and drag,” Jay Grissom, marketing director of Alcoa Oil & Gas, said. The pipe starts with a tapered, high-strength, aluminum alloy tube that is coupled with a steel tooljoint using aproprietary thermal connection technology that allows steel tooljoints to be attached to the aluminum pipebody. Alcoa produces the aluminum tubes at its Lafayette, Ind., facility and assembles the finished drill pipe at its facility in Houston. The AADP starts with a high-strength aluminum alloy tube that is coupled with a steel tooljoint using a proprietary thermal connection technology. BSP plans to use AADP on additional wells in Brunei. Shell is also planning a drilling project using AADP in New Zealand. AMRTUR, Alcoa’s service partner in the project, led the staging, inspection, maintenance and deployment of the aluminum drill string. 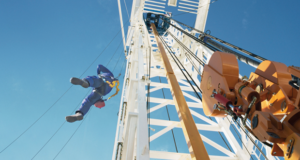 Xerafy, together with Protech Sales, USA Corp and idsTag, have implemented an integrated RFID technology solution for valve maintenance and inspections for Anadarko Petroleum. 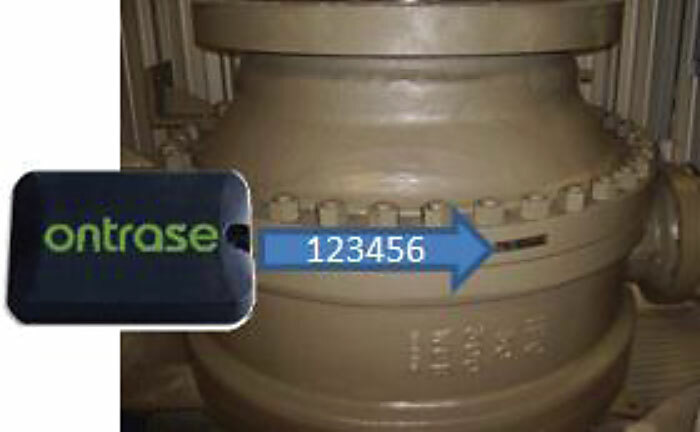 The Ontrase system supports valve maintenance and inspection operations at Anadarko’s oil and natural gas production locations in Brighton, Colo., and Salt Creek, Wyo. The Ontrase system is an end-to-end valve management system including a full line of valves, installation, servicing and greasing, as well as the recording and maintaining of all the data. The system provides real-time, actionable valve history to ensure on-time maintenance and compliance verification to reduce valve costs and audit penalties and avoid shutdowns and spills. Anadarko has deployed an integrated RFID system to support maintenance and inspection operations for thousands of valves. 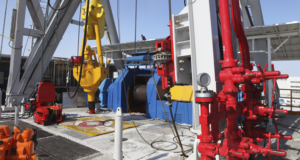 Anadarko is using RFID to track thousands of valves for valve servicing and inspection. The goal is to lengthen valve life and streamline EPA and OSHA compliance. Schat-Harding has set a freefall lifeboat record with its new-generation FF1200 boat. The boat was successfully dropped from a freefall height of 60 meters. The world record drop was conducted as part of the certification tests of the boat. The boat was loaded with seven tons to simulate the full capacity of 70 people weighing 100 kg each. The engine was started immediately and was left running for four hours along with different maneuvering tests. The FF1200 has completed the full-scale tests set by the new requirements for freefall lifeboats on the Norwegian Continental Shelf, DNV-OS-E406 standard. Previous: DEA 164: What does a next-gen ranging MWD look like?